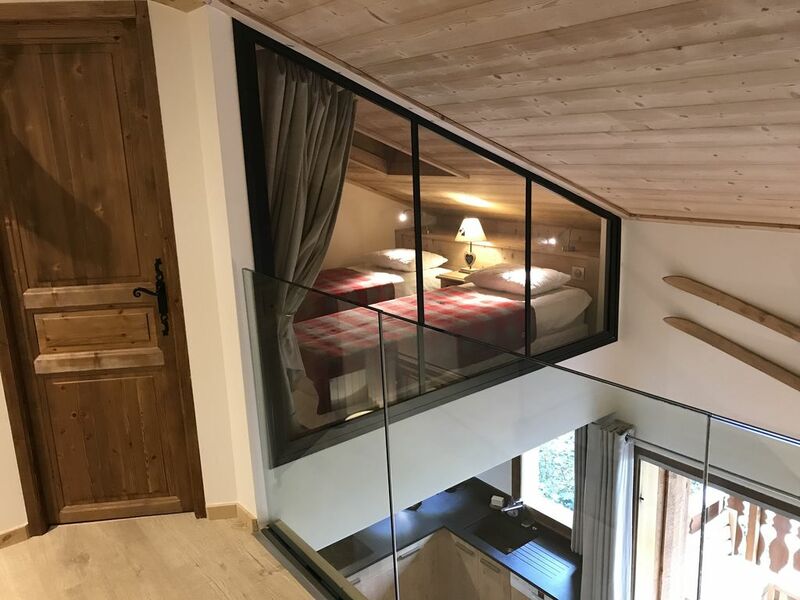 At the heart of the Three Valleys, the Méribel Mottaret resort, this duplex furnished like a cottage in the heart of a small building will seduce you with its clarity, its modern comfort, stylish decor and upscale amenities. - three bedrooms, one on the bottom floor which has its own shower room and separate toilet and two upstairs that overlook a mezzanine with bird's eye view of the large room. The master bedroom is equipped with a double bed. The other bedrooms each have two single beds that can be joined together to make a double bed. - The bathrooms have all been redone and consist of a bathroom with a large bath, a shower room and two toilets including an independent. The apartment is equipped with wifi. On the landing a private ski locker is available. Free parking next to the cottage. In addition, the judgment of the free shuttle throughout the resort and Méribel les Allues in front of the cottage. Cleaning at end of stay and possibility to rent sheets and towels on request. Beautifully & simply decorated. Modern kitchen & bathrooms. I particularly enjoyed the use of a properly functioning kitchen, as many ski apartments have tiny compact mini kitchenettes. Would have been good to have a selection of games for evening wind downs, or films. Not really ski-in/ski-out as described, but there was a shuttle bus going up and down. There was a fault with WiFi but everyone was experiencing this in the locality. So a bit tricky if you need to do a little work whilst away. All I all, it’s clean and tasteful. Great apartment, we were two couples on a ski trip. Description and photos were accurate. Short walk (200-500m) to the piste, shops and lifts of Meribel-Mottaret also a bus stop right next to the apartment Property was very clean, well maintained. There was a ski locker included. Customer service was excellent, prompt reply to emails and key pick-up/drop-off was well organised. Would love to come back one day and definitely recommend it to others. Mooie locatie, vlak bij de lift en naast de bushalte. Woning ziet er goed verzorgd uit, het ontbreekt aan niets. Siamo stati Ospiti per sette giorni in sei persone. La casa è molto accogliente, confortevole e ristrutturata di recente. Unico PROBLEMA che abbiamo avuto è stata la distanza dalla piste. A differenza di quanto ci era stato detto le piste sono lontane circa 400 metri a piedi con salita e discesa. In alternativa bisogna prendere l'autobus che porta alle piste in circa cinque minuti con una frequenza di circa 20 Minuti. In ogni caso raggiungerle si è rivelato faticoso. Cosy, bit of a walk to telecabine each day - though if more snow may not have been a problem. Mortared a great spot. Fantastic week of skiing in the three valleys, apartment is very spacious (for the Alps), very nicely decorated, kitchen is well equipped and all quite new. Good location, 100m down to lift to central lift area and also next to bus stop. We had a great week, thank you! At the heart of the three valleys between Courchevel and Les Menuires, Grand Duplex luxury fitted like a chalet in Meribel Mottaret. The apartment has just been totally renovated. It is equipped with high-end and has a very neat contemporary design. Merci de me contacter par mail a catherine.menuet2@gmail.com pour une confirmation de disponibilité INSTANT !! !